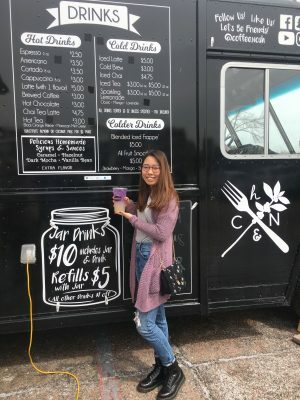 by Jesseca Ormond — Small crowds gathered around two food trucks in Peters Park this and last Thursday afternoon. One truck is from Heartland Coffee & Nosh and the other is from Daga’s Mexican Grill. The collaboration of these two trucks is called the Morningside Mash-up. The Peters Park food mashup brings lines of people for both Heartland’s Coffee and Nosh and Daga’s Mexican Grill. The Morningside Mashup will be around every Thursday, 11pm – 2pm until September 27. Form of payment is cash only. 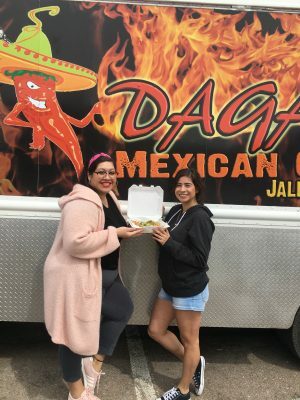 Menu items from Daga’s Mexican Grill include tacos, burritos, quesadillas, tortas, chips and queso, guacamole or salsa. There are also add-on items such as avocados, jalapenos and various types of cheese. Heartland Coffee and Nosh has variations of hot and cold coffees such as cappuccinos and iced lattes, specialty drinks and big jars of refillable lemonade. There are food options such as cinnamon roll waffle bites, shawarma and chicken or vegan bowls.